times more likely to develop autism. We are no longer accepting autism cases. The Centers for Disease Control and Prevention (CDC) reported in March 2012 that one in every 88 children has an autism spectrum disorder (ASD). This marks a sharp increase in autism diagnosis from 2002, when one in 156 children was diagnosed with an ASD. While experts disagree on the precise causes of autism, most agree that early detection and diagnosis are key to making the disability more manageable. "We have to get this down to 18 months of age to truly have the greatest impact," says Thomas Frieden, director of the CDC. Parents may be able to detect autism signs and symptoms before their child is 12 months old, and the American Academy of Pediatrics subcommittee on autism strongly urges parents to screen their children by a child development specialist at 18, 24 and 30 months. It is important to pick up the signs and symptoms of autism early. If your child demonstrates an inability to meet these developmental benchmarks, please visit your doctor. For more information, visit the Centers for Disease Control and Prevention website. The eyes are most important at this age. 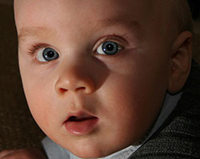 At nine months, babies should be able to make eye contact and, in some cases, recognize faces and emotional expressions. Children with autism typically struggle with eye contact and can have trouble mimicking emotive facial expressions. This is the stage in which cognitive development is taking shape. Normally developing children are typically eating with a spoon and drinking from a cup as well as responding to simple verbal commands. They also should be able to clearly pronounce simpler words. Children with autism may still be communicating by babbling instead of forming words or pointing. Tantrums and a rebellious nature is commonplace for normally developing children at this stage. Defiant behavior demonstrates that children are understanding more complex commands. Children should also be equating words with objects. Normally developing children begin to have a better grasp of handling more complex communication or situations. They should be able to properly express emotion either through words or facial expressions. Additionally, normally developing children should be demonstrating an ability to relate to others. Autistic children at this stage are unable to adapt to social settings by demonstrating a regard for other people. Cognitive abilities like turning the page in a book, drawing shapes and counting are typically demonstrated in normally developing children. They should also be able to follow more complex instructions and communicate willingly with their peers. Autistic children can struggle relating to their peer group at this age by not sharing toys or carrying on conversations. a guarantee, warranty, or prediction regarding the outcome of future cases.